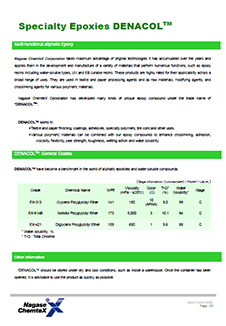 Denacol® EX-313 by Nagase ChemteX is glycerol polyglycidyl ether. It is a cross-linking agent for use in adhesives. It offers good reactivity and water solubility. Denacol® EX-313 is an environmental friendly and VOC-free grade. Low viscosity and multi-functional, it can be used in a wide range of application.